Renewables generated a record 21% of Australia's electricity in 2018, and with 14.5GW of new capacity under construction or with a financial commitment at the start of this year, 2019 could be another historic year, according to the Clean Energy Council's annual report. The amount of capacity that had financing arranged or was under construction is more than two and a half times larger than the 5.6GW that was at the same stage at the end of 2017. The 14.5GW is spread across 87 renewable energy projects and means the country is set to me its 2020 renewable energy target of 33TWh early, the council said. "In 2018, renewable energy entrenched its position as the lowest-cost type of new energy that can be efficiently built, and costs for new solar and wind power continued to fall — meaning investors saw more bang for every buck," said the council’s chief executive Kane Thornton. Wind power alone provided 33.5% (16.17TWh) of the total electricity generation from renewable sources, just behind hydro on 35.5%. These sources provided 7.1% and 7.5%, respectively, of Australia’s total electricity generation, the report said. Around 866MW of new wind power capacity was completed in 2018, according to the CEC report, including the 270MW Sapphire project. 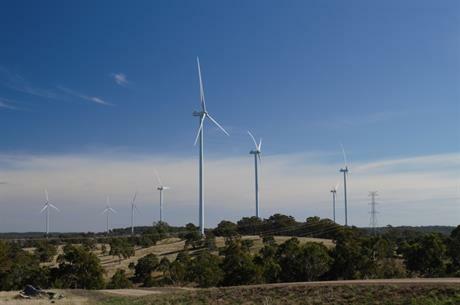 This is the highest annual total ever in Australia, beating the 768.3MW that was added in 2012. A further 24 wind farms totalling 5.69GW, were under construction or financially committed at the end of 2018. Cumulative installed wind capacity now stands at 5.6GW a 43% increase from five years ago. However, any short-term optimism is replaced by medium-term concerns over the lack of a clear energy policy from Scott Morrison's government beyond 2020, and with it the fear of losing the momentum generated over the past two years. "With no energy policy beyond 2020, the clean energy industry's extraordinary achievements risk grinding to a halt unless the next federal government commits to a sensible and enduring energy policy that can provide long-term investment confidence. "The states have acted to fill the gap with their own policies, but the lack of a streamlined national policy puts much of the remarkable progress that has been made at risk," Thornton said.